“愛” (Love), “陳” (surname of groom family) etc. according to your preference. 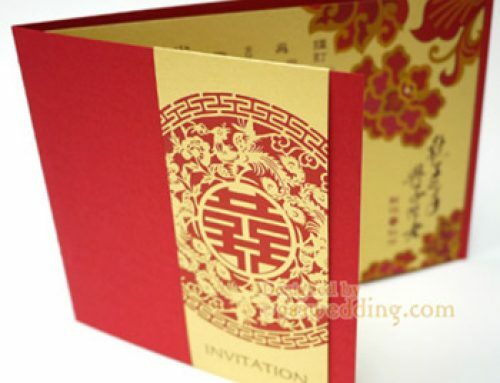 In the case of using it as a wedding invitation pocket, it is also possible to change the Chinese character into a double happiness symbol. The Red color is the main visual color of this design. It is to give a traditional Chinese look. A pair of lovely lovebirds is on the cover. It symbolizes the blessing to a couple that they will be staying together forever. 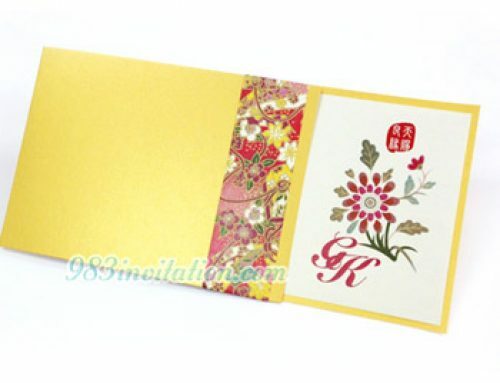 Usually, you will send your thank you card to your guests after your wedding. You may want to include a picture you take with the guests in the event. This pocket is perfect for you to put the picture, as well as the thank you note inside. 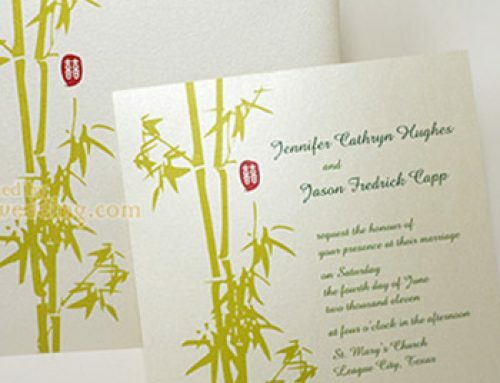 This design reminds us the classic Chinese wedding elements. 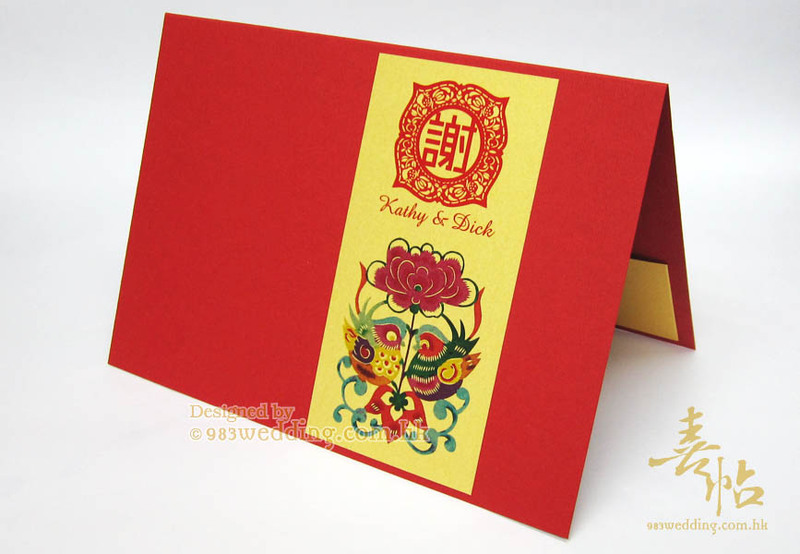 The red and gold color, as well as the paper cutting pattern, are the essence of this design. The cover is red while there is a strip on it. Without any surprise, this strip is gold in color. Paper cutting patterns are printing on it. On the top of the strip, you can print various Chinese characters on it. For instance, printing the word “謝” will mean thank you and the word “愛” will mean love. It is also possible to change it to the last name of the family, or any other Chinese character at your choice. The pocket is on the card inside. It is gold in color. If you do not want the contrast inside, you can change it into red color. While this design is perfect for your thank you card, you can also make this into your wedding invitations. 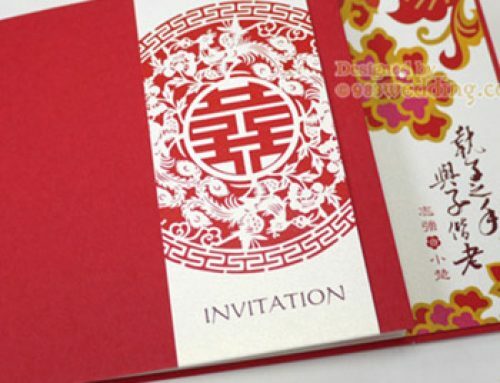 You can create a few single cards of wedding invitations and put them into the pocket. This is actually considered one of the standards if you need to include a lot of information in your invitations. You can choose gold color as the material for the single cards. This will echo with the whole design. 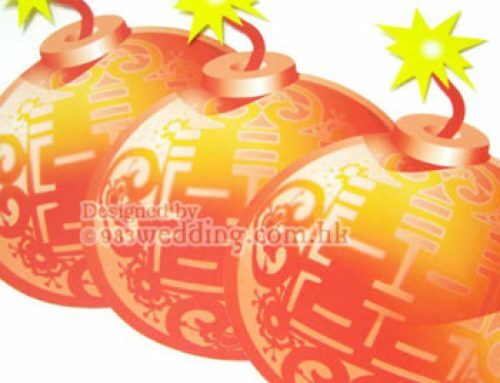 There are brides and grooms who may want to change the gold color to off-white or white color. It is possible to do so. Please contact us so that we can discuss the changes in detail. 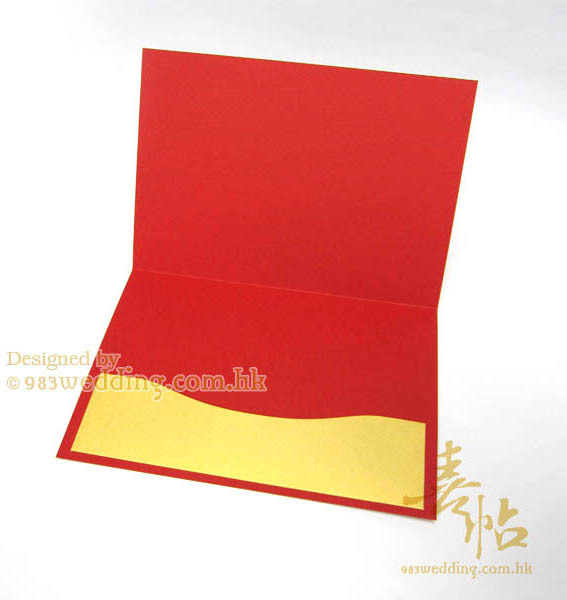 Red color paper cover glued with a gold color pearlized paper strip. Addresses would be printed on envelopes on request.